Talk to me, Tivo: When Dwight, who has a fear of public speaking, is asked to give a speech at a sales convention, he turns to Michael for help. Jam Cam: Football in the office is annoying especially when — D’OH! — they hit Jim’s desk. Poor Jim. Jim is being tortured by Dwight today, having his face rubbed in the fact that Dwight out-sold him and can buy a Tivo with the prize money. All Jim got was a Cagino’s Pizza that doesn’t play DVDs. “What did I do to deserve this?” Jim laments to Pam. Pam starts asking Jim if he’s going to be ok with Dwight winning or if he’s going cry. Then Phyllis comes out of the bathroom and asks Pam about her wedding dress. That, more than Dwight, will probably make Jim cry so he finds his excuse to get away. In her talking head, Pam tries to explain that it can get awkward doing all this wedding planning at work, that it can be weird and she doesn’t want to offend…Angela or someone. You meant Jim by someone, right? At the very least, Jim is getting really uncomfortable with all this wedding talk and decides to do something about it — leave. That’s right, our favorite sales man has decided to get over his crush by totally avoiding Pam’s wedding. Of course, he hasn’t really thought this through considering he has no idea where he wants to go, he just knows he has to get the hell out of Scranton. In order to help out Dwight, Michael decides to gather everyone in the conference room in order to give the salesman of the year some public speaking help. Michael starts looking for volunteers, asking Pam to use this as a way to practice her wedding toast. As she stammers to explain that the bride doesn’t do a toast, Jim decided he doesn’t want to hear about the wedding anymore and gets up there to deflect the nuptials crap. He’s going on a trip, he announces, and needs some help from his office mates. Are you sure about that, Jim? It turns out it was indeed a bad idea to ask everyone after Kevin suggests a naked resort and Toby recommends the loose women and legal pot in Amsterdam. Jim’s getting so desperate, he asks Dwight for advice. Dwight would go to Mordor and hike Mount Doom. Yeah, a place called Doom sounds like fun. But Dwight is only half-assing an answer — he’s more worried about doing this speech. Jim, who “majored” in public speaking in college, decides to “offer advice” to the sales leader. It’s not very good advice though considering it consists of banging your fists and reading speeches from dictators. Whatevs, Dwight may glance at it. Over in the conference room, Pam has taken the table over with her invitations and tries to justify to Kelly why she is having her reception at the VA. Apparently, Roy had a connection and it’s nicer than Kelly thinks or…Pam is just trying to talk herself into believing it’s ok. “You’re inviting Jim?” Ryan asks. Of course, he’s her best friend. Ryan seems to have picked up on something Pam either hasn’t or won’t admit to. As they stuff envelopes, Kelly talks about wanting a June wedding and Ryan says he doesn’t see ever getting married. Kelly walks off in a huff and Pam chides the temp for what he said. “It’s obvious she likes you,” Pam says “and comments like that…” hurt her as much as it hurts Jim when I complain about Roy being an oaf. Meanwhile, Oscar offers Jim a time share in Key West, which could work. Ryan the Negative Temp thinks Jim is just bluffing about the whole thing and will probably end up just eating ham and cheese sandwiches in Philadelphia for the weekend. Or steak and cheese as the case may be. But let’s not get too down on our world-wide traveler because he has found a destination. Australia! Pam tells Jim she has always wanted to go and Jim is — non-refundable ticket and everything. He has no idea where he’s staying, he has plenty of time to figure out the details between now and when he leaves…on June 8. Right before Pam’s wedding. Pam looks crestfallen. She’s marrying Roy, but seems so heartbroken that Jim, her best friend, is not going to be there. Jim seems taken aback by this as if he didn’t expect her to be so crushed by his absence. He tries to make it up by grabbing her invitations to throw in the mail but, in the end, there’s just a sadness between them. Stupid wedding. The Others: Dwight wins the top salesman award and heads to his big salesmen convention to do a speech without having an idea how to do a speech. Michael tries to give him some helpful tips so you know that’s going to be all kinds of wrong. In the end, after freaking out and not wanting to go up on stage, Dwight finally takes the plunge with Jim’s notes at his side. As he reads off Mussolini and bangs on the podium, the salesmen start clapping and Angela smiles in the back with her video camera. Whoa, Angela is there? What have we learned today, kids: Buying a non-refundable plane ticket to Australia is fine and all, but it’s not a good idea to run away from things you dread. Plane rides don’t make bad things go away — like a friend’s wedding, for example. Dwight: Oh, they’re having a sale on TiVo. Maybe I should get a TiVo. Ooh, DVD burner. Maybe I should get one of those. You are so lucky, Jim. You are so lucky you don’t have this problem. What was the ninth place prize again? A loaf of bread? Dwight: Oh great. Tasty terrific pizza. Question, do their pizzas play DVDs? Jim: What did I do to deserve this? Pam: Are you sad that Dwight beat you? 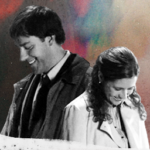 Pam: Are you gonna cry, Jim? Do you need a tissue? Phyllis: Hey, I heard that you got a wedding dress. Do you have pictures? Pam: Oh�uh yeah. Um…I’ll show ’em to you later. Jim: Oh, I should get back. Talk to you guys later. Pam: I have a ton of stuff to do for the wedding and I have to do it in the office and that can be kind of awkward�um�just because people can get all weird about wedding stuff. Then, I just — I just don’t want to offend…Angela or someone. Jim: [picks up his phone] Hi, yeah, can I talk to one of your travel agents? Jim: I’m gonna take a trip. I’m gonna get out of town for a while. And go someplace…not here. Jim: Where do I want to go? Um, that is an excellent question and one I probably should have thought about before I called you. Pam: Australia? I’ve always wanted to go there. Jim: I’m going. I’m a little nervous to run into Dwight on his connecting flight to Mordor, but other than that…um, yeah, I bought the ticket. Non-refundable. Pam: That’s awesome. Where are you staying? Jim: I don’t know. I feel like I have plenty of time to figure out the details. Pam: When are you leaving? Jim: Um…I’m leaving…on June eighth. Pam: Oh yeah, that’s too bad. Jim: Yeah. Do you want me to take these on my way out? [pointing at Save the Date cards] Pam: It’s okay, I got it.